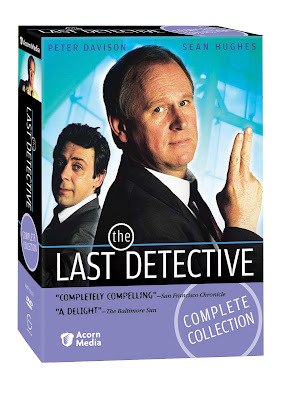 American fans of USA Networks' Monk will want to be sure to track down the Acorn Media DVD's brilliant stateside release of Britain's The Last Detective, which has become "a perennial top-seller on DVD, with each new installment performing better than the last," as more fans begin to catch onto this unique and charming series. Less grisly than most crime programs and far more character based-- The Last Detective stars veteran British actor Peter Davison (Dr. Who, All Creatures Great and Small, At Home With the Braithwaites) as the tongue-in-cheek dubbed "Dangerous" Davies. A.k.a. Detective DC Davies-- our man is jokingly referred to as "the last detective" as his hard drinking superior constantly reminds him that he's the last detective they'd ever want to look into anything important. Dismissing Davies with the jest that "little old ladies and dogs" are his specialty, in reality, audiences discover that Davies is a rare breed of detective. Empathetic, kind yet constantly ridiculed and unappreciated, the beloved outsider and underdog never fails to solve his cases-- no matter how "small" simply because he's willing to put in the time and effort to look beyond the obvious leads and usual suspects. Having kicked off the seventeen episode series spread over four seasons back in 2003 with a feature length pilot based on author Leslie Thomas's recurring character and first novel (that was used as previous British television fodder for a 1981 film, included in this set), Willesdon C.I.D. 's Inspector DC Davies is told point blank that in an ideal police department and situation, he wouldn't be a cop at all. With young hoodlums who say that "it's a pleasure to be arrested by you," after of course making him chase them through the small North London community until he's out of breath, not to mention his colleagues constantly giving him "the crap jobs," Davies stumbles onto new details in a twenty year old investigation right in the pilot. Looking into the case of a missing seventeen year old girl, Davies is stunned to ascertain that it may point to a larger cover-up involving his own department. Always the outsider but never losing his cool, he laments his status to his fellow "oddball" pal Mod (Commitments star Sean Hughes). Named after Tchaikovsky's brother Modesty as the series explains, Mod serves initially as the humorous go-to man for the entire run of the series as the bookish individual who accepts strange jobs from walking dogs to handing out fliers while dedicating his life to intellectual contemplation. However, he becomes DC's unlikely Odd Couple-esque roommate when the detective is forced out of his flat due to renovations. Although separated from his beautiful wife Julie, for whom he still carries a torch, DC finds himself sharing custody of their rather large dog and the show's writers-- using the dog as a link between the two as though it were a child-- leads the characters to some tender moments and an endless supply of breezy and unexpected comedic fodder. Anchored by an assured portrayal by Davison who notes in the roughly twenty minute DVD interview that the series appealed to him precisely because there were no stereotypical "drawing room scenes," Davies wasn't a "ruthless, tough-nosed cop," or a "super sleuth," but rather a kind man who's just good at his job-- after only a few episodes, you'll be wild about the inspector whose first name we never learn in a series that just grows stronger and quirkier with each successive season. Coming into its own footing in the second season (or "series" as they say in England), when the writers who'd updated Thomas's books managed to craft their own unique rhythm the cases begin to evolve into terribly complex mysteries with classic set-ups of overlapping cases that don't at first seem related, suspects who pop out of the woodwork and red herrings a plenty along with guest stars such as Jim Sturgess (Across the Universe), Toby Jones (Infamous, W.), Roger Daltrey, Julia McKenzie and more. Refreshingly managing to create a great network of characters that change over time as we begin to care for some of the supporting cast members whom we judged a bit harshly early on when soon DC's track-record begins to make him his boss's unlikely confidant and ally-- we're increasingly riveted by their remarkably authentic and surprisingly touching storyline as we learn more about Davies' "Gov." Of course, while enthusiasts of the show already have their favorites and I'm a bit partial to the wonderfully played Davies myself-- I do have to make particular mention of Sean Hughes' always entertaining Mod. Despite beginning the series as the scene-stealing funny guy whose friendship with Davies we don't quite understand, soon we realize that in his own odd way, they balance each other out and Mod helps him with cases simply by talking incessantly about anything and everything. Although the seasons have all been released individually, for those doing the math in this hard economy and wanting to conserve space in their DVD library, this compact and discounted complete collection managed to hook me from the start--yet one major disappointment was the lack of English subtitles since I feared I missed a vital clue every so often due to a few heavy accents and some characters' tendency towards slang that we're unfamiliar with here in the states. While it's fascinating to look at the previous adaptation of the book from a fan's perspective (even though admittedly, as Davison points out-- despite the "terrific actor," the '81 film wasn't "very good"), there's no substitute for Britain's most unappreciated detective who-- because of his charm and decency-- somehow always manages to be the first one to arrive at the conclusion of each spectacularly involving mystery.